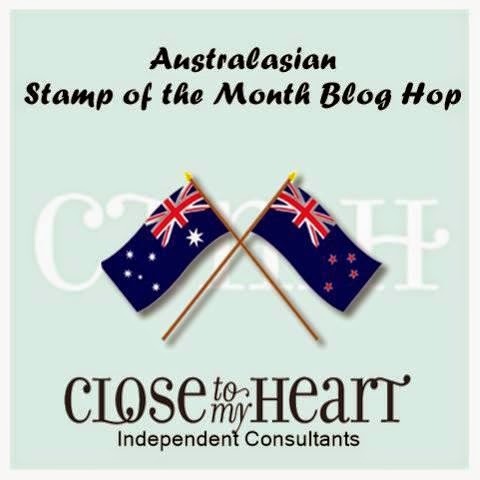 Welcome to the Australasian Blog Hop for September's Stamp of the Month - your one-stop shop for inspiration! If you have arrived here from Lauren's Blog, you are in the right place. September's Stamp of the Month is a delightful set of seven called "Family is Forever". The heart corresponds with a cut on the Artiste Cartridge, but this can just as easily be fussy cut. I can see many uses for this stamp set - from gifts to décor and scrapbook pages to cards. I am looking forward to seeing what my CTMH sisters come up with this month. This stamp set is worth $33, and can only be purchased in September. However, when you place an order of $75 or more with me this month you will be able to add the SOTM to your order for only $5. I have been playing with this easel drawer box design for a while, and have chosen the paper from the Wanderful range to go with it. What a versatile paper packet! The colours in my project are Crystal Blue, Bamboo, Kraft and Colonial White. I used a charm from the Storyteller charm set and a piece of Baker's Twine to finish it off. The easel sitting up. It is anchored by a heart stamped from the SOTM set raised up on foam squares. The drawer pulled out. You can put anything you like in it - sweet treats would be especially appropriate to go with the sentiment! I put some Twinings fruit tea bags and Avon Lip Balm. You need three pieces of cardstock. I scored, folded and daubed each edge before adhering with strong glue. I used Liquid Glass for a lot of this project so that I could be sure of it staying together. Please leave a comment before visiting your next blog, which is Vandra's CTMH Virtual Craftroom. What a gorgeous little box, and thank you very much for the instructions! What a fantastic gift! I love it. oh I love this little easel box card. I am definitely going to give it a go - thanks!